A new study examines the impact of elevated Down syndrome cell-adhesion molecule (Dscam) on how neurons develop, finding that in the fruit fly Drosophila the amount of Dscam proteins in a neuron determines the size to which a neuron extends its protrusions before it forms connections with other nerve cells. Ann Arbor — University of Michigan researchers have determined how a gene that is known to be defective in Down syndrome is regulated and how its dysregulation may lead to neurological defects, providing insights into potential therapeutic approaches to an aspect of the syndrome. Bing Ye, a faculty member at U-M’s Life Sciences Institute, found that in the fruit fly Drosophila, the amount of Dscam proteins in a neuron determines the size to which a neuron extends its protrusions before it forms connections with other nerve cells. An overproduction of Dscam proteins leads to abnormally large neuronal protrusions. 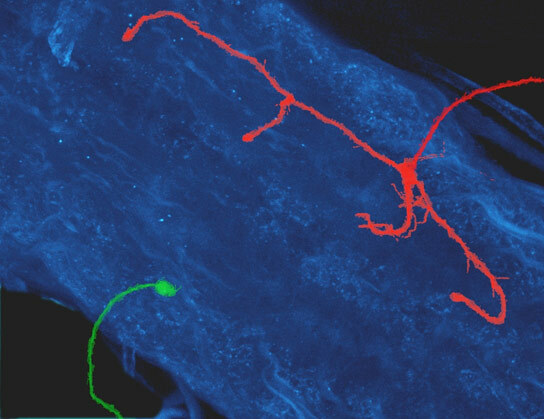 “But because of the important roles of Dscam in the development of neurons, its related defect is very likely to be an aspect of Down syndrome and it may be an aspect of the syndrome that can be treated,” said Ye, an assistant professor in the Department of Cell and Developmental Biology at the U-M Medical School. Ye’s study is scheduled to be published online June 5 in Neuron. Other authors were Jung Hwan Kim, Xin Wang and Rosemary Coolon of the Life Sciences Institute and the Department of Cell and Developmental Biology. The research was supported by the National Institutes of Health, Whitehall Foundation and Pew Scholars Program in the Biological Sciences. Be the first to comment on "Researchers Target an Aspect of Down Syndrome"